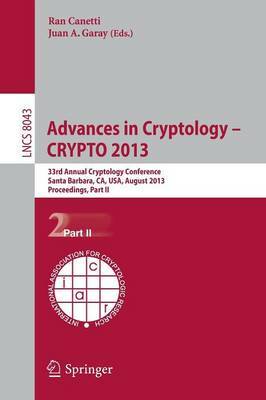 The two volume-set, LNCS 8042 and LNCS 8043, constitutes the refereed proceedings of the 33rd Annual International Cryptology Conference, CRYPTO 2013, held in Santa Barbara, CA, USA, in August 2013. The 61 revised full papers presented in LNCS 8042 and LNCS 8043 were carefully reviewed and selected from numerous submissions. Two abstracts of the invited talks are also included in the proceedings. The papers are organized in topical sections on lattices and FHE; foundations of hardness; cryptanalysis; MPC - new directions; leakage resilience; symmetric encryption and PRFs; key exchange; multi linear maps; ideal ciphers; implementation-oriented protocols; number-theoretic hardness; MPC - foundations; codes and secret sharing; signatures and authentication; quantum security; new primitives; and functional encryption.